Tinuvin® XT 100 FF by BASF is a high performance light stabilizer system based on high molecular weight hindered amine NOR™ light stabilizer. It is cost effective and is designed to provide stabilization to greenhouse and mulch films for a longer lifetime. It shows a good performance even in presence of agro-chemicals such as pesticides, insecticides or soil disinfections. 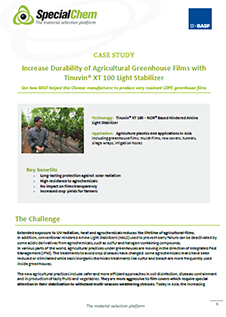 Recommended dosage for Tinuvin® XT 100 FF is 0.2–2% for greenhouse and mulch films.